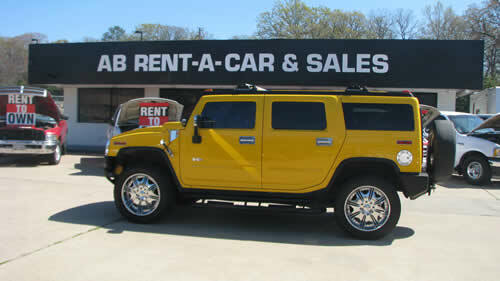 AB Rent-A-Car Inc. was founded by Frank Cervera Jr. in 2010. As a child he spent many days on his dads’ shoulders observing him purchase and sell vehicles while at the auto auctions. His father stood 6ft 1 and while in the auction ring, he would place Frank on his shoulders While holding his knees to keep Frank sturdy, he would tap Franks' right knee if he wanted to bid to signal Frank to raise his hand for the bid. Other purchasers in the auction ring didn’t want to bid against a child so this was not only a rewarding experience for Frank but also a learning experience. Needless to say they got some “awesome” deals. This is when Frank knew the automobile industry was his passion. He began selling cars at the tender age of 10. At the age of 16 Frank began attending auctions without his father purchasing vehicles for the business. This made for a steady and sturdy foundation. Franks love for automobiles grew as he matured and learned by watching his father. Franks mother embrased him with wonderful contributions as well. She showed Frank the value of being honest and the rewards of helping people. These attributes he keeps very close to his heart and applies them in everyday business. Frank has never forgot the gratitude of all those people his mother helped in various ways. Frank was determined to honor his parents by opening a business that would truly offer value and outstanding service to the community. He promised himself to always provide affordable reliable service, regardless of his business grew. East Texas was a place Frank seemed to be at ease. He was accustomed to living in the hustle and bustle of a large city, however when in Tyler, he would slow down, take a deep breath, and enjoy the beautiful trees of East Texas. He fell in love with the clientel that lived here. This was going to be his home and where he wanted to establish a business. Our first location was on Hwy 64 West. We began with 5 rental and 2 retail vehicles. Those 5 rentals cars doubled within months. After 6 months of business we were blessed enough to have outgrown our precious, small location. We absolutely love our customers and wanted to stay in the same neighborhood. We found a location just a few minutes from our beginning location. The community support we had was astonishing. This gave us great motivation to keep building our small independent company. We are fortunate enough to have a combined total of over 350 Rent-To-Own Units. We are steadily growing and building our business to better serve you. In 2017, we launched our second AB location. It's located in Longview and the community welcomed us with open arms. We already had a wonderful customer base in the Longview/Kilgore area and is growing by leaps and bounds. This location, after a young age of one year... currently has over 100 Rent-To-Own customers. "Thank you, for doing it the AB Way!" Copyright © AB Rent-A-Car Inc./ AB Rent-To-Own LLC. All rights reserved.